We will photograph the colors left on the vines and ground. 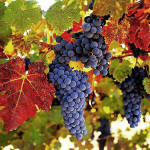 It is well after the harvest but you often find a few stray unharvested grapes to work with. Landscapes, close ups and abstract subjects are likely to be bountiful. You will need to be a part of the carpool (even if you are solo in your own car) because we may have to change some of our destinations based on the changing weather and options available to us in any given vineyard. Bring your tripod. Stacy Boorn will share a few of her “favorite” Napa/Sonoma sites. We will also share various in-filed camera/photographic methods with each other. Double and multiple exposures, depth-of-field choices, composition, wide angle, macro and much more. Return home around 5:00 PM.